January 28, 2014 was the worst day of our lives: A parade of awful news culminating in our 11-year-old daughter Caitlin nearly dying during her spinal fusion surgery. Possibly due to some unusual quirk of her Aicardi syndrome, blood left her body faster than the doctors could replace it. In the end, she received 1 ½ times her own blood in transfusions and was resuscitated on the operating table. We had been made aware that this was a distinct possibility and were glad we’d had the ability to clear our schedules of all editorial projects during Caitlin’s surgery and recovery. As much as we loved working on a magazine and anthologies, our focus was squarely on Caitlin, and rightly so. Thanks to excellent doctors, nurses, therapists, and our amazing network of friends, Caitlin made it. She recovered from the surgery, sits much better now, and has a better quality of life. We are truly blessed to have so many wonderful people in our lives – many of whom have helped us on this next part of our professional journey. By the late spring of this year, we were ready to return to editing. We wanted to create a project that’s the culmination of everything we’ve done and learned — filled with passion, joy, family, friends, and beauty. After months of discussion and planning, we developed the magazine that you’re reading RIGHT NOW. We chose the name Uncanny because we wanted a publication that has the feel of a contemporary magazine with a history– one that evolved from a fantastic pulp. Uncanny will bring the excitement and possibilities of the past, and the sensibilities and experimentation that the best of the present offers. We even created a fake history of the magazine for Tor.com. It’s our goal that Uncanny’s pages will be filled with gorgeous prose, exciting ideas, provocative essays, and contributors from every possible background. When we chose to Kickstart Uncanny, we knew there would be massive risks and challenges. At every step, we were overwhelmed by the generosity of SF/F readers and professionals from around the world. Friends and colleagues pledged their work and backer rewards, helped us create the Kickstarter video, and spread the word throughout the SF/F community. An all-star team have now joined us to create each issue of Uncanny : Michi Trota- Managing Editor, Erika Ensign- Podcast Producer, Steven Schapansky- Podcast Producer, Deborah Stanish- Interviewer, Amal El-Mohtar- Podcast Reader, and Caitlin Rosemarie Thomas- Ombudsman. Jeremy Tolbert of Clockpunk Studios designed our phenomenal website. Katy Shuttleworth created our logo mascot and wordmark. When discussing our mascot, Katy asked what we wanted, we said… space unicorn? Sure, why not! And the Space Unicorn that Katy delivered became the rallying point for the Kickstarter, epitomizing everything we wanted for the magazine. We began to refer to our backers as the Space Unicorn Rangers Corps. And we grew. Not only did Uncanny fund, we reached every single stretch goal. We are still flabbergasted and deeply grateful. The best way to thank all of you for making this dream possible is this, our, first issue, which you now hold in your hands. Our first issue of Uncanny features six original stories. Ken Liu explores a near future story where a son in America cares for his dying mom in China in “Presence.” Amelia Beamer’s story features a girl who invents time travel to meet her grandfather in “Celia and the Conservation of Entropy.” Maria Dahvana Headley recounts the perhaps fictional last days of Jungleland in “If You Were a Tiger, I’d Have to Wear White.” Max Gladstone shares a story set in a supervillain bar revolving around a loser who crosses the line in “Late Nights at the Cape and Cane.” Christopher Barzak writes a tale of a teen boy meeting the real Peter Pan in “The Boy Who Grew Up.” Finally, Kat Howard weaves a mythic tale of immortality and a phoenix in “Migration.” Our reprint this month is “Her Fingers Like Whips, Her Eyes Like Razors” by the much missed Jay Lake. 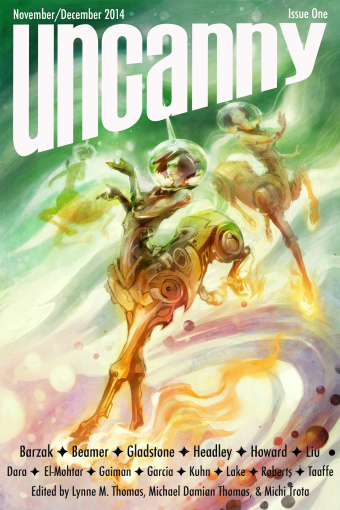 Uncanny’s first issue also features poetry by Neil Gaiman, Sonya Taaffe, and Amal El-Mohtar, interviews with Christopher Barzak, Maria Dahvana Headley, and a special interview with Tor editor Beth Meacham about Jay Lake’s life and career. In nonfiction this month, Sarah Kuhn discusses being a female comic book fan and building communities, Tansy Rayner Roberts explores the blending of romance and science fiction, Christopher J Garcia gives his picks for the ten best SF short films available on the Internet, and a roundtable of convention runners including Emma England, Michael Lee, Helen Montgomery, Steven H Silver, and Pablo Vazquez discuss Worldcon as a concept and how it should change or remain the same. Our November podcast features Maria Dahvana Headley’s “If You Were a Tiger, I’d Have to Wear White” and Amal El-Mohtar’s poem “The New Ways” (both read by Amal), and an interview with Maria conducted by Deborah Stanish. Our December podcast features Amelia Beamer reading her story “Celia and the Conservation of Entropy,” Sonya Taaffe’s poem “The Whalemaid, Singing” (as read by Amal El-Mohtar), and an interview with Amelia conducted by Deborah Stanish. And so it begins. Adventure! Excitement! Derring-do! SPACE UNICORNS! Welcome. We’re glad you’ve joined us.